Native to Europe, Asia, and Africa. Introduced into North America in the 1600s. 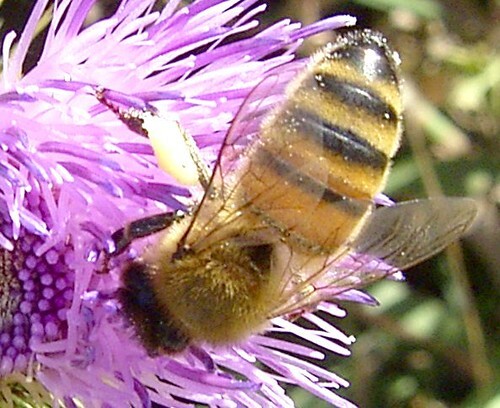 There are seven species of honey bee, all are in the genus Apis. None are native to North America. Western honey bee (Apis mellifera) was introduced into North America in the early 1600s and is now found worldwide. African honey bee (Apis mellifera scutellata) is a subspecies of western honey bee. As featured on Gizmodo, MNN.com, Yahoo News, and more. Slow motion honey bees, edited to dubstep with some interesting facts about bees. The Western honey bee or European honey bee (Apis mellifera) is a species of honey bee. The genus Apis is Latin for "bee", and mellifera comes from Latin melli- "honey" and ferre "to bear"—hence the scientific name means "honey-bearing bee". The name was coined in 1758 by Carolus Linnaeus who, realizing that the bees do not bear honey, but nectar, tried later to correct it to Apis mellifica ("honey-making bee") in a subsequent publication. However, according to the rules of synonymy in zoological nomenclature, the older name has precedence. As of October 28, 2006, the Honey Bee Genome Sequencing Consortium fully sequenced and analyzed the genome of Apis mellifera. Western honey bee (Apis mellifera). The Golden Insect is a short Documentary about this marvelous insect scientifically named ( Apis - Mellifera ) Apis is Latin for Bee - Mellifera is Greek for to bring Honey, or as is commonly known today as Honey Bee. It was shot in 1986 with the help of students from KvB College in Sydney Australia. These images are of Yellow Indiangrass being worked by a Honey Bee for it's pollen. From my google research, I've not found this interaction between these two species.